Heritage buildings and places are loved by the general public but as the world and our lives change they sometimes need to be re-imagined. 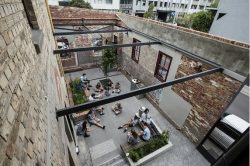 The Heritage Council and Office of the Victorian Government Architect are holding a panel discussion for Melbourne Design Week 2018 on Good Design and Heritage. Good design married with existing heritage can result in design effects that have profound impacts on cities and communities. Emma Telfer from Open House Melbourne is joined by leading heritage and architectural experts including Stuart MacIntyre, Jill Garner, Philip Goad and Peter Lovell in a one hour panel session for Melbourne Design Week looking at some great examples and principles behind good design and heritage. Tickets are via Eventbrite – follow the link here. This event is part of Melbourne Design Week 2018, an initiative by Creative Victoria in partnership with NGV. From 15–25 March, local and international design innovators will present a series of exhibitions, talks, studio tours and industry-led events exploring the wide-ranging effects of design on contemporary life.